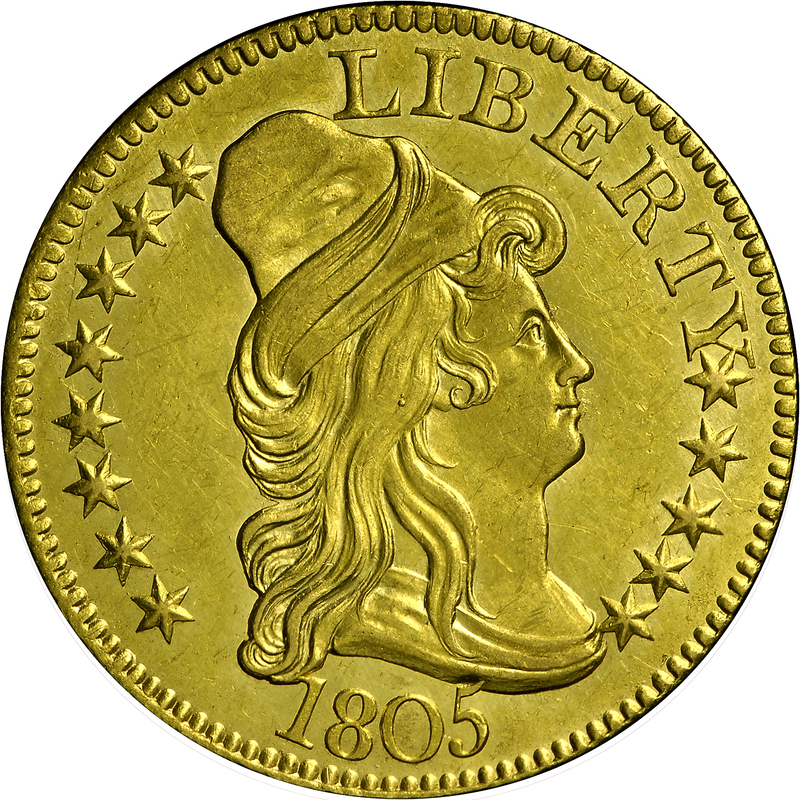 This lovely Mint-State half eagle represents the second known reverse die of 1805, and is designated Breen 3-D. 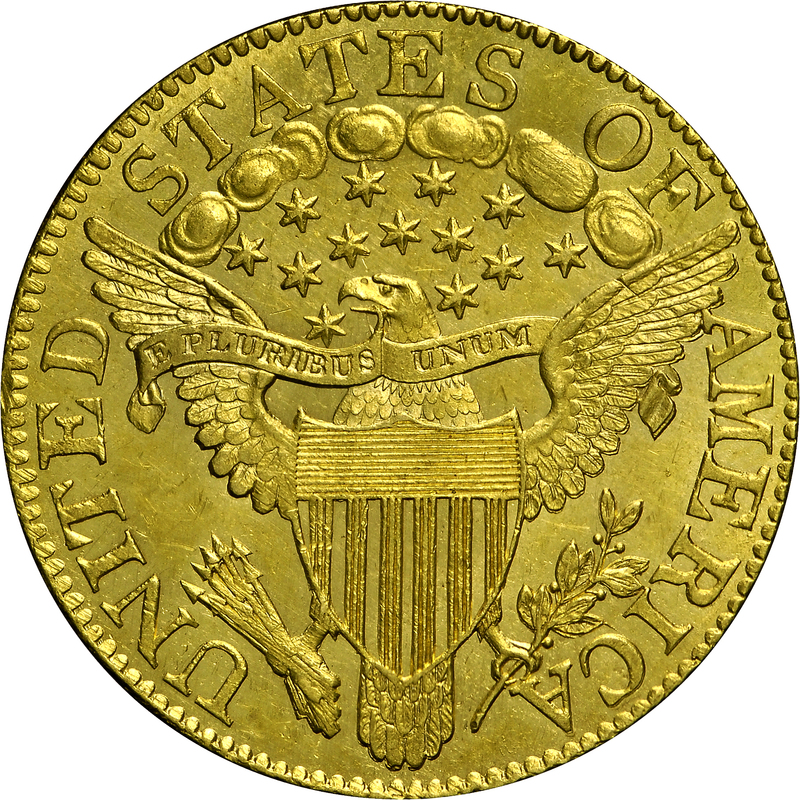 This is the only appearance of the reverse die, while the obverse is in an earlier die state than with its appearance at HBCC-3092, the Breen 3-B marriage. Many of Walter Breen’s descriptions are very brief and lead to some confusion. The reverse described as reverse C appears to be the same as reverse B. 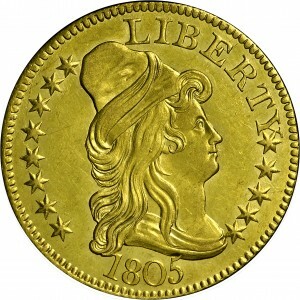 Therefore, just two reverse dies are known with this obverse. From Abe Kosoff's sale of the Alex Shuford Collection, May 1968, Lot 1937. "Obverse: Close date. Perfect 1, top serif touches curl. Tip of 5 overlies bust. Point of star 13 imbedded in drapery. No crack thru 0. No horizontal die scratch above cap, to star 8. Reverse: Lowest berry centered under left foot of A. Lowest arrowhead bit left of being centered under N. Space between two clouds aligned with right side of upright of (T)E. One leaf attached to lower left serif of I by a spine. Lowest outside leaf has spine at tip, below curve of C. Lowest berry touches branch, its stem miniscule. Left side of ribbon loop from eagle's mouth very weak. No cracks from top of U."